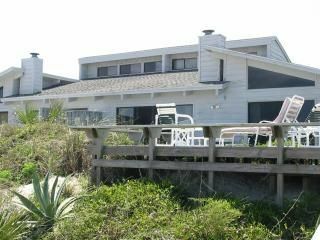 **Oceanfront Paradise1** What a Beach House Is Meant To Be! Why stay in a small, cramped hotel room when now you can enjoy this magnificent beachfront 3BR/3BA townhouse with panoramic views of the Atlantic Ocean. Located just a one hour drive from Orlando and the Disney/Universal theme parks, this unique property has a huge two-tiered oceanfront deck with private access to the most exclusive "non-driving" area of New Smyrna Beach, recently voted by Florida Travel Magazine as the "Most Beautiful Beach in Florida". This beautiful home has a fully renovated kichen with top of the line GE Profile appliances, renovated bathrooms and plenty of living space. You'll also have use of a full-sized pool (shared by 9 other homes), private lighted tennis court, secluded outdoor shower, barbecue grill, fireplace and much more. Since the home is built into the natural landscape of the dunes, you can enjoy the beauty of the beach flowers and plantlife, as well as a large family of sand tortoises and dolphins that live near by. Pelicans glide gracefully overhead, and if you're lucky you can witness the endangered sea turtles laying their eggs on this protected, non-driving portion of the beach, a family of manatee just up the road, or magnificent pilot whales just off shore. Now add to all this the most modern of 21st century conveniences. A 50" flat screen TV with digital cable and WiFi wireless internet access. First run movies on demand available 24 hours a day right from the comfort of your own living room. DVD player with a selection of classic movies. Luxury Saatva mattresses that rival the finest upscale hotel beds. What you have is the most perfect vacation spot anywhere! The property is available for a minumum stay of 7 nights during peak season. Off season 3 night minimum. Discounts for stays of more than one week are available. Please check our website for a calendar of available dates (under rates and information). Please note that this is not a timeshare, but rather is a private home being offered by the owner directly. Since we understand that making travel plans can be difficult, we have a liberal cancellation policy. Cancellations must be received in writing by email to owner. Renters must be 30 years or older and provide valid drivers license as proof of age. We do not allow parties, weddings or any other special events at this home. Directly on Florida's most beautiful beach. Private beach stairs down to sand and ocean below. Private deck directly overlooking the ocean, with plenty of comfortable seating and private beach stairs. Shared with 9 other townhouse owners. Not heated. We have stayed at this property numerous times and have enjoyed each occasion. The ocean views and access to the beach are unsurpassed The New Smyrna Beach community is quiet and restful enough, yet it offers sufficient restaurants and activities. We loved our vacation here! Great property right on the ocean front! Super clean and large enough to hold our entire family! We loved our stay. Beautiful, clean beach house right on the water. You step off your gorgeous - private deck right into the sand. Paradise! We stayed at the beach house for a week and had a fantastic time. The location is absolutely perfect on the no-drive beach and it is just a few steps to the beach. No need to worry about long walks or stairways to travel down. We could even sit on the deck and let the kids play right in front of us. The house is older, but the kitchen is fully remodeled and the living/dining area is much larger than it appears in the photos. It was perfect for our family trip! If you walk along the beach in this area, you won't find many houses with a beautiful deck right on the sand such as this one. This is truly a house made to relax and enjoy. You'll feel right at home with the extensively equipped kitchen and roomy living room. It also features a state of the art giant BBQ grill so you don't have to stay inside to cook when everybody is enjoying the deck without you! Beds are comfortable and everything was really clean. Breakfast on the deck is the best! Cancellation policy details provided with contract proposal.